Walking along the snow covered lakefront, where the blizzard left its plentitude, is very much like writing. On my walk this morning, the path initially was clear, not down to the asphalt but to about an inch of snow, sporting the footprints of those who had gone before me. But suddenly my way was blocked: The plow had left the wall of snow it had been pushing in the middle of the path, and had not gone any farther. How very often am I writing along and everything is going well, when I suddenly reach an impasse? When I have to look around to see how others tackled it? Many footprints had trampled on over the wall, so surely I could do the same. “Can you see the ground?” he asked. “Yes, I think I can see the ground” I replied. “As long as you can see the ground as you’re driving that bulldozer, you’re fine,” he said. 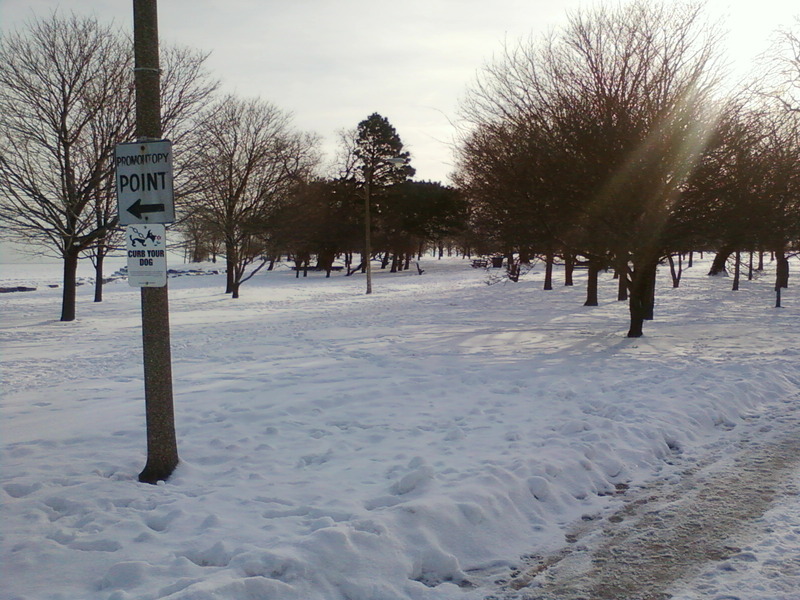 So, the snow plow had seen the ground and there was a path along the lakefront. There was no path, however, out to the Point, the peninsula into Lake Michigan that’s usually part of my walk. The plow hadn’t gone there, and I wasn’t wearing my tall snow boots so I couldn’t go there. I had to take a different path. How often do we come upon a section in our writing that we know we’d like to tackle, but the timing isn’t right? Or we have to write our way around it? Or we have to get the right equipment, do the research to fill in the missing data? Or we might decide that no, we’re just not going there. Some areas are off limits. On along the plowed path I went until I reached my usual turnoff, the underpass to get back to the other side of Lake Shore Drive. The plow had continued on the lakefront, so the underpass wasn’t plowed, but the snow wall to reach it wasn’t that high. And then oddly, the underpass was full of snow. Passable, but still I had to stomp through. How often do I run into a passage that I think will be easy and it’s not? On the other side of the underpass: No plowed paths whatsoever. Just several footpaths trampled through the snow by those who had gone before. Which one to take? There I went with the one closest to my usual path, all the while watching my step because sometimes there’d be a hole, deep as a boot, where someone had sunk in. Even when you can see the ground, there can be holes! And then the way home – my building in sight, but mountains of snow where the sidewalk usually is, and again, several footprints to follow. The bad news: there will always be unexpected obstacles; the good news: people have gone before you, and they’ve made it. You just have to follow. Very nice piece. I liked how you wrote about the path with obstacles and related it to our lives. Great metaphor–the snow and your writing. A lot of good points in this one for all of us who write and maybe for others who can apply it to whatever they pursue. Thanks, Shelly and Nancy. It always amazes me what ideas I get while walking. I guess that's why so many writers walk! Wonderful piece. Enjoyed the comparison to writing. I find walking a wonderful way to come up with ideas. Also, thanks for the Mary Karr "Lit" info. I'll check it out. Thanks. BJ, glad to hear walking works for you as well! Let me know what you think of "Lit" if you do read it.